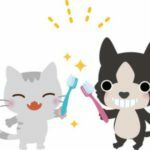 How often should you brush your cat’s teeth, and is infrequent brushing worse than not brushing at all? 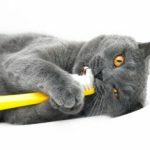 In this article, you will learn not only how frequently cat tooth brushing is required, but also why inconsistent brushing may not work as intended. Brush your cat’s teeth daily! It’s the most important tool you have. Plaque builds up on teeth all the time, and the best way to remove it is to brush your cat’s teeth. If you think daily is too often, some literature suggests a minimum of brushing your cat’s teeth three times per week, on the condition that the cat has no dental disease. Anything less is not only useless, but it may also have negative aspects, which we will talk about below. Visit a veterinarian annually for dental checkups. Similar to the way a dentist checks your teeth, a veterinarian can look for signs of tartar and gum inflammation in your cat’s mouth. It’s best if it’s done at last once a year during regular checkups. 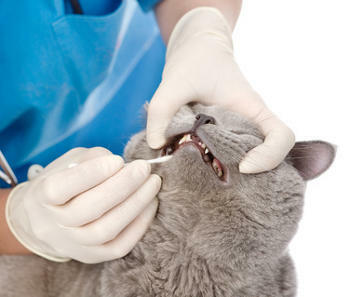 If you haven’t cleaned your cat’s teeth since the beginning of the world, it’s advisable to start with a vet visit. Provide things to chew and appropriate nutrition. Chewy things may improve your cat’s dental health, but still, relying only on this is like scooping water out of the boat with a shovel, whereas a bucket would work better. But why is it necessary to clean your cat’s teeth daily? After finding out that daily cat tooth brushing is necessary, a question may arise about whether it’s still okay to do it less frequently. What if you brush your cat’s teeth, let’s say, monthly? Would it still be better than not doing it at all? Plaque builds up. Plaque is a film, consisting of bacteria, that naturally builds up on the teeth of mammals. Scientists theorize that those bacteria help to fight other bacteria that may be more dangerous. However, bacteria in plaque are also responsible for tartar buildup, tooth decay, gum disease and bad breath. Bacteria “eats” food particles that stick to your cat’s teeth and, in turn, creates acidic substances that promote tooth decay. Plaque begins to harden. This happens instantly, but it usually takes at least a day to become hard enough to be resistant to brushing. Tartar is developed. As the plaque continues to build up and harden, it turns to dental calculus, also known as tartar – a mixture of calcium phosphate, carbonate and organic material. Tartar is very thick and cannot be removed by brushing. While the time frame depends on your cat’s overall health and diet, tartar usually begins to form within one week, if no tooth brushing is done. Tartar promotes tooth decay and inflammation of gums and can affect your cat’s overall health. Figuratively speaking, tartar creates a rock solid shield for bacteria, under which they are out of the toothbrush’s reach. This lets bacteria multiply, speed up tooth decay, and promote even more buildup of tartar. The worst scenario is that the bacterial growth begins to spread to gums and tongue and eventually reaches your cat’s bloodstream – a highway to other organs. To get rid of calculus, mechanical or ultrasonic cleaning is required. Unfortunately, this must be done at a veterinary clinic under general anesthesia. Therefore, you have two choices: First, brush your cat’s teeth daily, or second, each year expose your pet to the risks of general anesthesia while having his teeth cleaned at a vet’s office. You also have a third option – don’t bother at all, and extract your cat’s teeth one by one as he gets older. Yes, the above statement is loud. We like it to be loud because we want you to hear it. You might think that cleaning your cat’s teeth monthly is still better than not cleaning them at all. Unfortunately, this practice may not only be useless, but it may be damaging as well. It’s not effective. Tartar is very hard and resistant to brushing. The best tool for removing it is a dental scaler or ultrasonic tools. Brushing? Meh…it does scrub something off, but if you do it only once a month, more tartar will build up than is taken off. It’s stressful to a cat. As you might have noticed, tooth brushing is not that natural a thing to a cat. However, cats who are used to it daily can learn to accept this procedure without any stress. It becomes a habit that goes without saying. Not gonna happen if you show a toothbrush to a cat only once a month. It has to be a habit to work. You don’t get to learn the proper technique. Cat tooth brushing is not that easy a task, and it requires practice. Getting your cat used to tooth brushing is a gradual process of learning, both for you in handling the tooth brush and for your cat in learning to accept it. 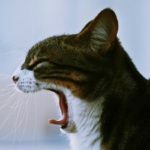 If you do it only once a month, you don’t learn to do it well enough, and you are likely to damage your cat’s gums as well as his trust in you. We should now mention that getting your cat accustomed to tooth brushing is a gradual process. You don’t start with a full tooth brushing in the beginning, but try to at least get your cat used to the taste of the toothpaste (don’t use human toothpaste) and to your touching his teeth. Many cat owners swear their cat will kill them if they approach with a toothbrush, but they are later surprised how easy cat tooth brushing becomes with proper training. The good news is that all it takes is to get into the habit. 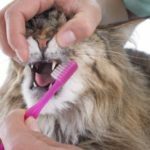 Set a time of the day for brushing your cat’s teeth, and within just a few weeks of training and learning, the whole process won’t take more than a few minutes of your time. It will be as easy as brushing your own teeth. That being said, in our next article, you will learn how to clean your cat’s teeth properly as well as how to train your cat to accept brushing easily. Find our other articles about tooth brushing and cleaning of cats here.